Manage your iPhone on Windows using DearMob iPhone Manager. Are you an iPhone user? Do you use iTunes to transfer content or take backups of your phone from a Windows computer? If you are a little annoyed by iCloud backup limits or if you are simply looking for a tool that can help you transfer content between your iPhone and Windows computer. DearMob iPhone Manager is a one-stop solution for your needs. DearMob iPhone Manager works with all iPhones, iPods, and iPads and lets you transfer all possible files from your iPhone to a Windows computer. The tool acts as a great companion and a good alternative to iTunes. To start using the tool all you need to do is connect your phone to your computer and wait till the connection completes. Once you’ve connected to your computer and trusted the connection on your iPhone, you are ready to transfer content. 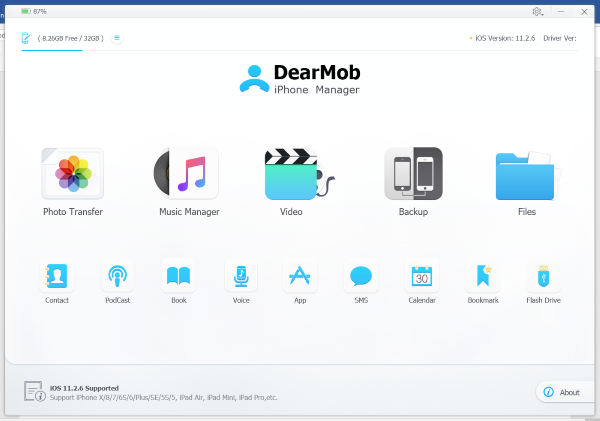 DearMob iPhone Manager lets you transfer Photos, Music, Books and practically any file you can open or view on your iPhone. 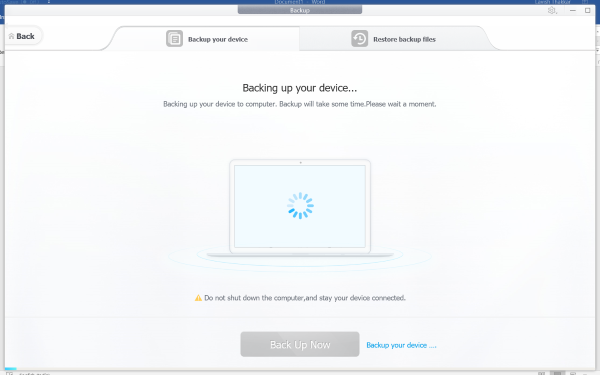 Moreover, you can take full device backups if you wish to reset and clean your device. Full device backups are stored on your computer’s hard drive, and they do not have a limit on max size. Most of the features of the application are discussed in detail in this post. DearMob iPhone Manager features an outstanding photo management and transfer tool. You can view photos on your device from different albums. 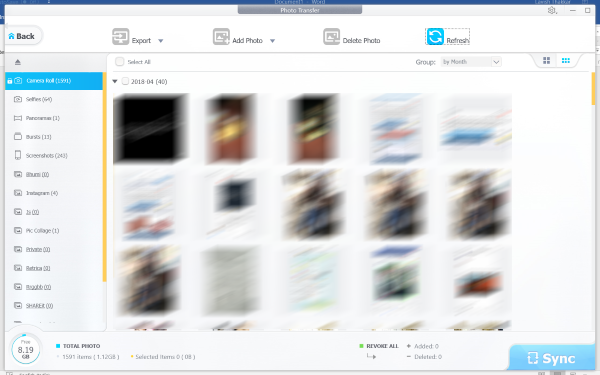 Or you can simply select the photos you wish to transfer and hit the ‘Sync’ button to initiate the transfer. Transfers can take some time depending on the amount of content you want to transfer. Overall, the tool transfers content at a higher speed as compared to other tools. iPhone Manager also features a similar video transfer module that would let you view and transfer videos available on your phone. 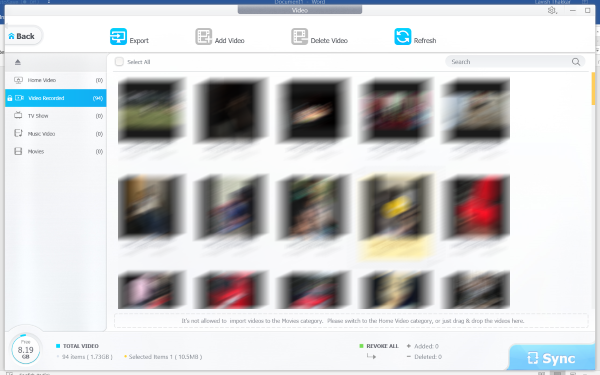 Moreover, you can add more videos to your device and delete the existing ones. Music Manager lets you export music from your phone and adds more music to your phone at the same time. You can import any audio files using the music manager. Moreover, you can directly play music from the application itself. The program also lets you set ringtones from custom audio tracks. If you have quite a lot of music on your phone, you will find it easy to navigate around and select your tracks with the music manager’s intuitive UI. This is one of the most important features of the tool. Most users might use this tool just because of its great backup and restore capabilities. The backup module lets you create a full backup of your device irrespective of what is inside it. The backup can then be used to restore a device or transfer data to other devices. This really comes handy if you are planning to reset your phone. Or if you are planning to switch or upgrade your iPhone. Full backups do not take much time and are fast enough keeping in mind the size of content that is available on your device. Creating a backup is simple as is, connect your phone and go to the backups module and start the backup. Similarly, you can restore this backup to any device. The backup module also supports encryption which means that you can password protect your backup files. To restore such backups, you will have to enter the password again. Almost all of this data is maintained in iCloud, but you can view contacts, SMS and calendar events on DearMob iPhone Manager as well. But for that, you might have to disable some iCloud related settings on your phone. Instructions to do so are provided within the application and are easy to follow. Once done, you can import/export contacts, read SMS, create new contacts and much more. Moreover, you can see the calendar events, add events and even delete the existing ones. If you read quite a lot on your iPhone, then you might find this module useful. 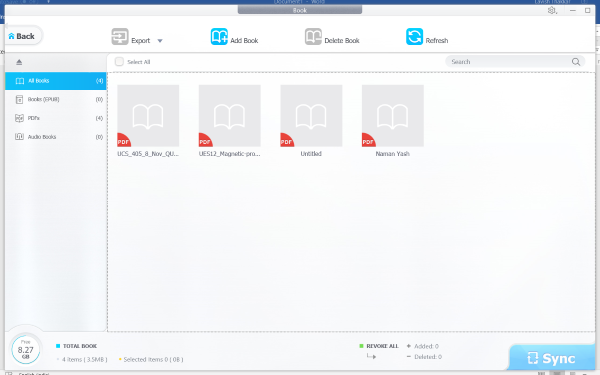 Books would let you sync all sorts of documents including PDF, ePub, and audiobook. Not just that, you can also convert files to ePub, HTML, PDF, and TXT for Kindle compatibility. Apps module is quite useful as well. Here you can manage and create backups of installed applications. The program lists all applications that have been installed on the connected device. Clicking on any application will let you manage its files, settings and some minimal configuration. The best part of this module is the export and import feature. You can export any installed application as an IPA file and use it later. 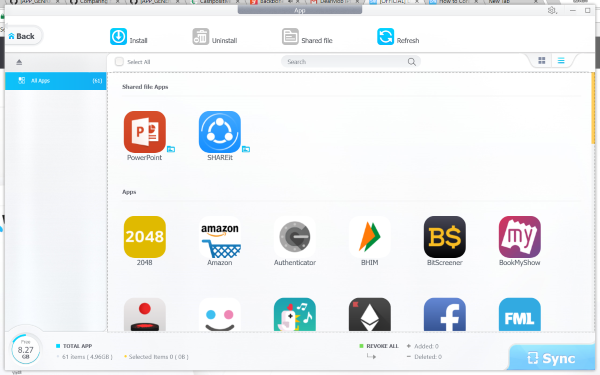 Very similarly, DearMob iPhone Manager also lets you install applications on your device from an IPA file. This gives you the flexibility to install applications that are not available in the app store without jailbreaking your iPhone. This module will let you mount your iPhone as a secret USB. You can store any kind of file and create a proper directory structure in this virtual USB drive. A great feature if you quickly want to transfer some files in and out from your iPhone. DearMob iPhone Manager is an outstanding tool with really good features. If you are an iPhone and a Windows user, this is one of the best tools that you can use to manage your phone. This tool can easily be used as an alternative to iTunes for Windows. iPhone Manager is quite easy and straightforward to use in comparison to other tools. The features offered are complete in themselves and does not require iTunes or any other software for that matter. Click here to buy DearMob iPhone Manager. yeah maybe if they would stop trying to charge more money than they deserve, someone would buy that. But for not iFunBox with iTunes installed is free and works fine. iFunBox has (serious) issues regarding privacy! Pay attentie, this product is from China. See on there website on the compeet bottom. (http://www.miitbeian.gov.cn/) Copyright!!! Potentially all your data has been coppied to China. That’s why this is FREE. Big question is, would it save all my messages and the photos within, to extract over 2,000 photos from a group message?